Here’s an overview of what MacVector can do for you! Whatever alignment your sequence needs, MacVector has the right tool. 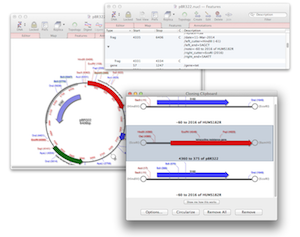 Multiple sequence alignment of protein or DNA sequences using CLustalW/Muscle or T-Coffee and produce publication quality alignments. Sequence assembly of NGS data against a reference genome or sequencing of your new construct. Search for similar sequences in the NCBI’s Genbank database with your sequence using BLAST or search your own local set of sequences. Translated Alignments: Align DNA sequences based on their translations. Align proteins against a reference comparing known proteins against unknown ones. 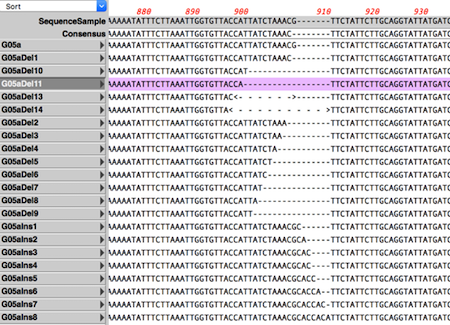 Auto Annotation of sequences with common plasmid features. InterProScan: Scan proteins for functional domains. Automatic ORF Display visualize open reading frames. Graphical BLAST Results Visualization of your BLAST search..
Cloning history Every ligation in the construction of a plasmid is documented, wth enzymes used, any end modification, source of the fragment and date. Agarose Gel to run out digested sequences. Easily identify restriction site(s) to screen successful clones from incorrectly ligated inserts. MacVector makes primer design both easy AND powerful. Primer Database store your primers and scans sequences for potential binding sites. This entry was posted in Tips and tagged pcr, restriction digests, results. Bookmark the permalink. Both comments and trackbacks are currently closed.